6 Must-Try Street Food In Bangkok That Will Make Your Tastebuds Explode! Bangkok is just one of those places on a foodie’s checklist. One of the many attractions in the city is its street food. However as Bangkok is such a large city, it isn’t always easy to find the foods you’re looking for. So come check out our list streets foods forget about stressing over hunting for the best picks. A delightful dish of Thai style shredded green papaya. This sweet, sour and spicy dish is one of the healthiest you’d find in Thailand. A good place to have this yummy dish would be at Phetchaburi Soi 7. 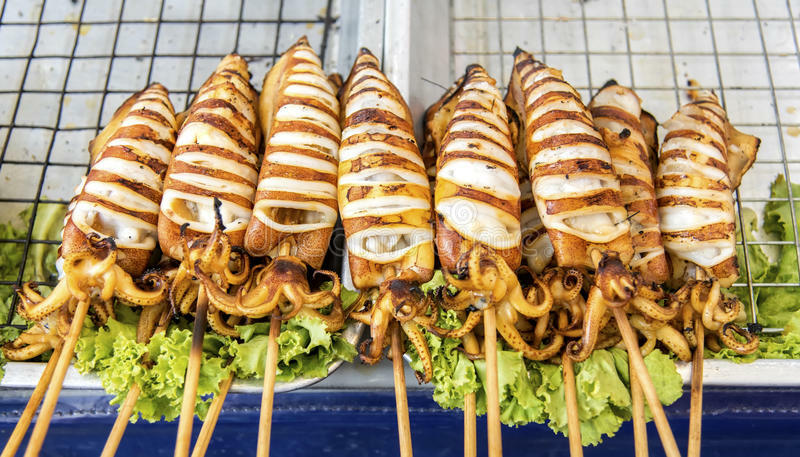 Bangkok’s famous grilled squid is one of the best seafood options to go for, as it is simply grilled over charcoal and served with a deliciously sour and spicy Thai sauce. Be sure to get the ones that are cooked fresh when you order! Location: Can be found pretty much anywhere on the streets! Get your authentic seafood tom yum fix in Pratunam at super affordable prices! Choose the level of spiciness you desire and be entertained by the super friendly owner who has been selling his delicious tom yum for many years now. You can even check out his Facebook page for pictures and more info! Location: Pratunam. It’s just across the road from Citin Pratunam Hotel. A classic favorite! What makes mango sticky rice stall greater compared to other mango sticky rice stalls would be the quality of the sweet mangoes, and the fluffiness of the sticky rice. This particular stall, Partunam Sticky Rice is well known amongst locals and foreigners alike for its quality mangoes, and is located in the heart of Pratunam! Khanom Buang is a an old style Thai dish that consists of two different kinds of fillings; the sweet being a mix of foi thong (golden egg yolk threads), coconut, persimmon or candied gourd on a pandan base or the savoury; using egg, shrimp and cilantro in a thin, crepe/taco like shell. One of the best khanom buang can be found at the heart of Sao Ching Cha in Bangkok, as this family has been making it for over 100 years! Location: Heart of Sao Ching Cha (Giant Swing) area in Bangkok. Kanom Krok (Thai coconut hot cakes) is another must-try dish. It is a sweet dessert made of coconut milk, tapioca starch and rice flour. The savoury bit of this dessert comes from the topping of green onions usually all cooked on a circular cast iron pan. Usually crispy on the outside and melty-fluffy on the inside, this dessert is definitely best when eaten fresh off of the griddle! Location: Dusit. Across of Ratchawat Market, along Thanon Nakhon Chaisi Road.